Calli is a range of acrylic-based, pigmented, water-resistant inks designed especially for calligraphy. 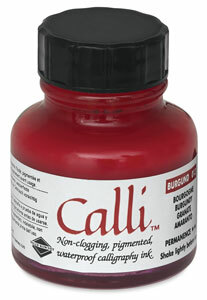 Calli Calligraphy Inks are available in six popular colors and offer optimum flow characteristics from a pen or brush. ® Daler-Rowney is a registered trademark.™ Calli is a trademark.